Think of the time you wake up. What do you do? You probably constrict or tighten your muscles for a second before stretching—arms above your head, feet stretching downward. After engaging in this stretch, you probably relax. Think of how your pet dog or cat wakes up after a nap: feet forward, belly down, back arched upwards, and perhaps a yawn to go with it. 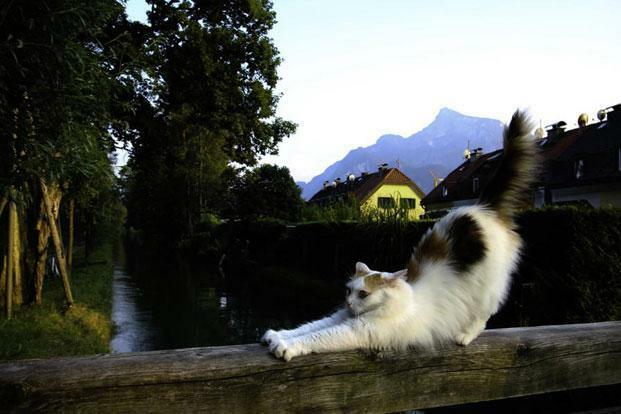 We think of this movement as a cat stretch, but these animals aren’t stretching. They are pandiculating. A pandiculation is a constriction of muscles followed by a stretch. Constrict, release, relax—that’s the sequence. Animals do it effortlessly. There is no thought of “pushing” themselves, or taking their effort “to the next level” so that they can beat this week’s goal. Animals pandiculate about 40 times a day. Human embryos pandiculate during gestation and continue to do this all through childhood. Watch how a baby wakes up, and you will understand the pleasures of a nice pandiculation. What does this mean in plain English? The myofascial system is like a thin skin that covers our muscles. Sometimes, it gets inflamed. Here is the thing though. A muscle ache or pain that you feel in one part of the body may have its origins elsewhere. Just because your calves hurt doesn’t mean that you stretch only the calf muscle. Even doctors concede that aches could come from remote parts of the body. Bertolucci’s paper argues that pandiculation is a way of toning the entire body and preventing chronic and local pain because it is movement with attention—as in yoga. The most famous verse in the yoga sutras of Patanjali would be, arguably, Sthiram Sukham Asanam. Sthiram means grounded, stable, motionless. Sukham means pleasant, filled with ease, beatific. Asanam refers to posture. This verse tells us to ease into every posture that we hold and figure out a way to make it pleasant. The next verse, Prayatna Shaithilya Ananta Samapattibhyam, tells us how to do this. By not putting in too much effort and focusing the mind on the infinite (or emptiness), you gain anantha or bliss in every pose. Prayatna means effort. Shaithilya means relaxation, dilation, looseness, dropping, slacking. Ananta is eternal joy. Samapattibhyam is a confluence or coming together of the body and mind when you focus attention on them. Slack off a bit, says the verse. Loosen up. Effort may be the way to achievement, but the mind-body connection is more holistic and subtle. Which part of your body stores your tension? For many, it is the shoulders. For some, it is the back of the neck. After a couple of hours of tapping away at the computer, where do you feel the tightness? Does your back experience pain? If so, consider a pandiculation—easy enough to learn on YouTube if you don’t want to go to a practitioner. These somatic exercises are usually used in the context of pain relief, but you can get a head start with pain prevention too. For me, the biggest learning was that all stretches aren’t automatically good. Depending on where you feel pain, a stretch may cause your muscles to tighten up. In instances such as these, what you need is a pandiculation, which loosens and dissolves constrictions. In this age when effort equals reward, it is not comfortable to do less. In “working out”, you might experience some pain, but you gain later on. These simple constrictions, and intentional but quiet stretches, are not heroic or difficult. In the long term, though, they may be the best thing you do for your myofascial system. Shoba Narayan stores her tension in her shoulders. Write to her with your tips, tricks and short cuts. She blogs at Shobanarayan.com, tweets at@shobanarayanand Instagrams at #shobanarayan.